Deposits on the Sierra de Atapuerca have provided an archaeo-paleontogical revolution at European level. Not only human fossils have demonstrated our presence on the continent for nearly a million years, but also have become an essential reference for any study on populations of the Middle Pleistocene fossils. Learning and making it compatible with your favourite activity does not need to be impossible: Spain offers infinite possibilities to play golf, with plenty of Training fields where you can enjoy an unforgettable experience, including spas, massages, saunas allowing us to recover from a funny day among greens and flags, attending Spanish lessons at the downtown or the hotel. With the diversification of companies and banks, new products and services appeared, not only aimed to experts but also to any individual who wanted to invest his savings. 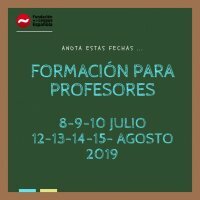 This year, the Fundacion para la difusión de la Lengua y Cultura Española launches this course into the market being confident that it will be of a great interest to both professionals and individuals who wish to understand this new terminology which Spanish has created and adapted within the world of finances. The Fundacion para la Difusión de la Lengua y Cultura ¡ Española, in cooperation with companies of the region and based on its experience on the management of students' mobility programs, offers ALL AGES foreign students, whether University students, Further Education students, or workers who are currently developing their professional work, the possibility of carry out a period of practices in companies of the region, with the aim of professionalization and the work learning skills in our region, and in addition learning Spanish, thus combining these activities with Spanish lessons and complementary activities so that it gives a chance to students to learn about our culture.